Just last week, rumors began to circulate that The CW was thinking about green-lighting a Blackstar spin-off after Arrow reaches its conclusion next season. If this episode is an indicator of what we’ll see, I’m not very enthusiastic about a potential spin-off/sequel. I’ve absolutely loved the flashforwards this year. 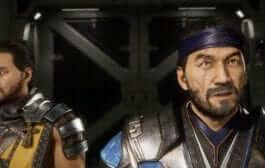 Yeah, I know that I’m in the minority on this but I find these older versions of our characters intriguing to see and the Queen children have been a joy to watch. Is the make-up a little cheesy? Probably. To be honest, Felicity doesn’t look all that different in 2040 than she did in 2019 (albeit with a different haircut). Rene’s wig is…let’s just say a little off-putting. Despite that, I realize that there’s only so much you can do to ramp up the “aging” process for a show like Arrow. I’ll still say that The CW’s CG and the make-up department is just as good as some DCEU movies. Most fans see the flashforwards as a waste of the present day story. At times, I feel the same way. Everything in Star City crumbles and Oliver’s crusade, at first glance, looks meaningless. But, I’m a sucker for when a protagonist rises up to become the hero they were destined to be. That’s one of the reasons why I love movie franchises like Star Wars. And that’s why I have enjoyed this storyline. I’m telling you this because I’m about to lay into the flashforwards a little bit and I wanted you all to know where I was coming from. “Star City 2040” did its best to ruin the likability of Mia. I’m on the Arrow subreddit quite a bit and I think the sentiments there describe it best. The drama between her and Felicity was just was too edgy and too forced. 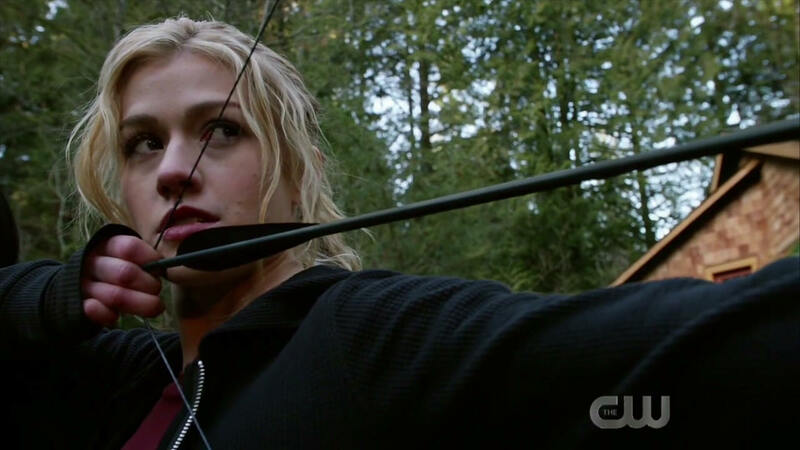 The fact we don’t specifically know why Oliver and Felicity wanted to raise Mia out in the woods, away from the rest of Team Arrow, doesn’t help either. And the drama wouldn’t have been that big of a deal but it was the foundation of the entire episode! At least we had that pretty cool Nyssa Al Ghul cameo. Not only that, but Rene’s change of heart came out of nowhere. Yeah, we know him as the vigilante who would do anything to save people in the present day. But, the flashforwards have painted Wild Dog in a new, more slimy, light. I’m not saying he should have stayed an antagonistic character. I just wish it took more than another heart-to-heart with his daughter to change his mind on Galaxy One’s plans. Maybe I’m being a little harsh as the revelation that Felicity was alive could’ve been the trigger for him. It was just my gut feeling on his arc. I was ecstatic when the flashforwards began with William and Roy on Lian Yu. That’s because I thought Roy would be a huge part of season seven. Spoiler alert, he hasn’t. Roy’s been a small part of this season but at least he’s in it. That’s something I guess. Sometimes he even decides to do a few flips to remind us that he still exists. I thought “Star City 2040” could have focused on him a little more, maybe even revealing why he exiled himself to the island in the first place. Not only did they not answer anything regarding his character but then they created another one if that strange scene at SCPD is any indicator. Although I had a lot of issues with “Star City 2040”, I thought it mostly came together after the Mia and Connor scene. Team Arrow is (sort of) back. They go out to save the city and actually succeed in doing so (for now). It’s not so doom and gloom in the future after all. 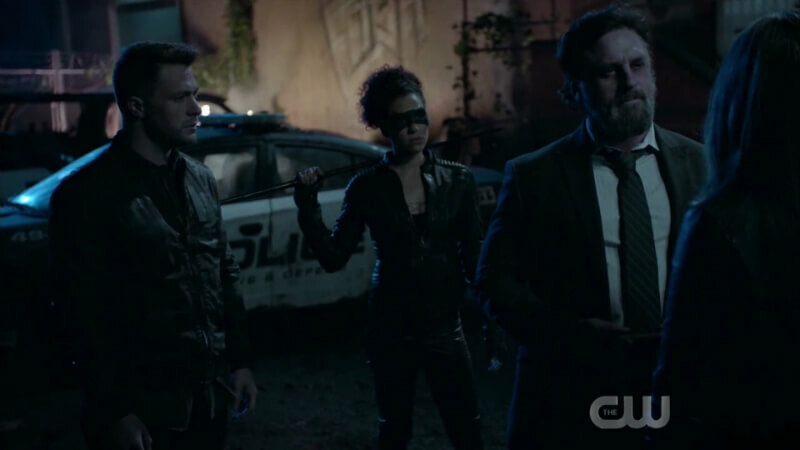 Sure, Oliver and Diggle are probably dead but…yeah, there’s no way to spin that. This part of it is still a bummer. Anyway, like the holding cell fight scene, I thought the action at the party was great. Mia has taken her first step on her journey to take up her dad’s mantle. William and Felicity shared some touching moments and Roy even got to be involved. 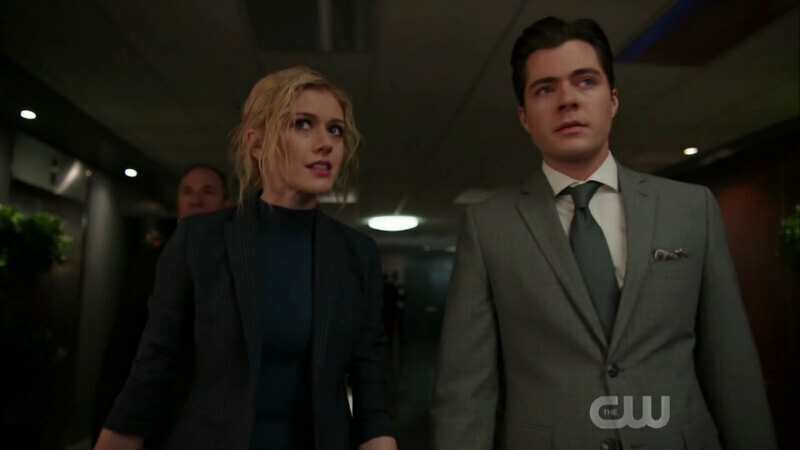 Instead of focusing the remainder of the season on the bombs hidden in Star City, the flashforwards can now move on to whatever that Galaxy One CEO has planned next. I was really hoping that mask he was showing would have been Deathstroke’s though. Verdict: “Star City 2040” was pretty disappointing for me, especially since I’m in the minority as someone who actually enjoys the Arrow flashforwards. The episode did everything in its power to turn the audience against Mia and the forced drama was, unfortunately, the focal point this week. Although I’m still a fan of the flashforwards, I hope this isn’t a backdoor pilot because I just can’t see myself getting invested in a full season with this cast of characters. Hopefully, this story arc takes its promising ending from this week and builds on it so we can get a satisfying conclusion this season. Roy was in this episode! How is Artificial Intelligence Transforming the Future of Gaming Industry?